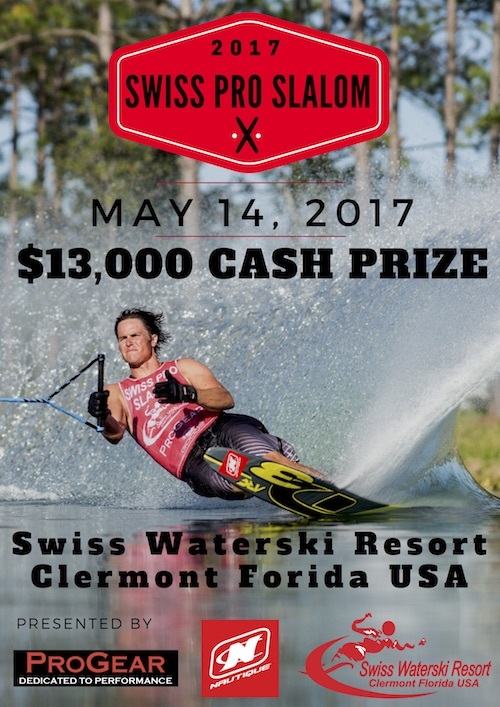 Swiss Waterski Resort is proud to announce the 3rd edition of the Swiss Pro Slalom featuring the best slalom skiers from around the World battling out a $13'000 Cash Prize in a 2-rounds & Finals competition. The Swiss Pro Slalom has become a classic event offering world record conditions pushing the skiers to the limit of their art of slalom skiing. Reigning Champions Nate Smith and Regina Jaquess both from the USA will face fierce competition showcasing the best slalom skiing and drama to crown the next Swiss Pro Slalom Champions in Open Men & Women. Water skiers from around the world come to Swiss Waterski Resort for its perfect ski lakes, beautiful surrounding scenery, and dedicated instructors led by head coach Clint Stadlbaur. Located outside Orlando in Clermont, Florida, Swiss Waterski Resort was established in 1979 and has provided the ultimate ski experience for decades. The staff ensures that all guests have a memorable stay by holding to the highest standards of Swiss service. At Swiss Waterski Resort, you will discover the perfect combination of rigorous training and resort vacation. Features include a fleet of new Nautique boats, stylish Mediterranean villas, pools, heated spas, and a pristine golf course. Ready for paradise? Book your next water ski escape at Swiss !